The following is a draft research project I recently wrote, which I’ll be publishing serially over the next week. Part 1 here. PLAN Type 093 diesel-electric submarine. Via Wikimedia. Anti-access/area-denial capabilities are the core strategic challenge facing the United States. Proliferating weapons technologies have democratized lethal force, giving unsophisticated opponents the ability to deny superior opponents the ability to project power. The Pentagon’s challenge is to overcome anti-access/area-denial systems “no matter where they are or how they’re presented,” a Department of Defense briefer recently remarked. “To that end, for example, we see state actors with well-funded militaries that possess the most advanced kinds of anti-access/area-denial capabilities and technologies—in some cases, multilayered across all of the war-fighting domains.” Of course, recognizing the challenge of anti-access/area-denial capabilities is not the same as actually finding a way around them. Surviving in an A2/AD environment is an unaddressed strategic challenge, and one that will only grow more difficult as the lethality and proliferation of anti-access/area-denial platforms increases. Anti-access/area-denial capabilities are part of but distinct from the broader notion of asymmetric warfare—asymmetric warfare is a strategy, while A2/AD capabilities are platforms used to execute that strategy. More specifically, Chinese A2/AD strategies seek to prevent the United States from controlling key areas like straits, littorals or choke points, denying US forces the ability to operate from large bases in the region, and prevent the US Navy from projecting power from the sea. Barring the ability to completely deny the US effective operation in the Western Pacific, Chinese area-denial strategy aims to deter American intervention in the region by increasing the risk to US fleets that venture too close to China’s shores. Chinese enthusiasm for asymmetric strategies is not new. During the Cold War the PLAN was structured around an asymmetric defense of Chinese littorals against an invading Soviet amphibious force. Chairman Mao’s doctrine of an asymmetric “People’s War” and the example of Soviet sea denial strategy heavily influenced the early PLAN and its focus on littoral shore defense and, in Mao’s words, “maritime guerrilla operations.” While the PLAN’s focus on asymmetric warfare was partially a product of limited resources, it was also a rational response to external threats. China’s geography is uniquely suited for asymmetric naval warfare: unlike other many other maritime nations the Chinese mainland does not actually border an ocean, but instead partially enclosed seas. This geography creates littoral choke points that restrict the movements of an intruding naval force, empowering a prepared asymmetric defender. Today A2/AD is an organic part of Chinese strategic thinking. Chinese doctrine places great importance on strategic depth, a concept deeply tied to area-denial. The Chinese concept of maritime strategic depth is defined by “lines of control” demarcated by twin island chains, running from north to south along the eastern Asian coast. The “First Island China” runs from Japan south through Taiwan to the Parcels in the South China Sea, and the more distant “Second Island Chain” includes Guam and encloses the entire Philippine Sea. China’s island chains’ geographic thresholds determine the shape of Chinese area-denial strategy; in a conflict China would seek to entirely deny the US Navy the ability to operate within the First Island Chain, and heavily contest the second. These boundaries have practical as well as symbolic significance—the geographical limits of the Second Island Chain matches the 1,3000 nm range of a US Tomahawk cruise missile. Anti-access/area-denial capabilities are a particularly attractive strategy set for China due to its strategic asymmetry with the US, and American dependence on power projection from centralized assets. People’s Liberation Army forces are far less capable than their American counterparts. This asymmetry is especially apparent in China’s naval forces—a major roadblock for Chinese strategic aspirations in the Western Pacific. The inferiority of China’s naval forces is partially due to its technological and industrial inferiority to Japan and the West, but also China’s history of prioritizing land forces. Currently China is unable to directly match the technological sophistication of US assets. PLAN surface ships are less advanced than American designs, though this gap is rapidly shrinking. China does not possess operational aircraft carriers, nor mature amphibious warfare capabilities. Chinese naval weapons and sensor systems are more primitive than their Western counterparts. Even Chinese missile systems—commonly understood as the most formidable PLA weapons systems, prioritized in a clear example of asymmetric countering—lag behind the America’s, though again this gap is closing. Similarly, Chinese attack submarines are not comparable to advanced US designs. Chinese aircraft design lags farther behind US assets than its naval counterparts. China has struggled to produce domestically manufactured jet engines and China’s most formidable air assets, like the J-11 and Su-30MKK air superiority fighters, are derived from Russian designs. While the recent unveiling of the J-20 stealth fighter aircraft is a significant step forward for the Chinese aviation industry, it is unclear how capable the aircraft is, or when it will enter operational service if at all. Chinese long-range bomber aircraft are based on Soviet designs dating back to the 1950s, and are not comparable to the US Air Force’s unique intercontinental bomber force. While the People’s Liberation Army Air Force appears to be shifting from a “quantity over quality” model towards fewer, more advanced aircraft, the Chinese aviation industry is decades away from even beginning to match the technological sophistication of US and allied designs. Platforms and weapons are the most advanced facet of the PLA, followed by human capital and organizational assets. Technology is an important component of military capability, but people and institutions are what translate force into victory. A serious shortcoming in Chinese power is its lack of institutional military experience. The Korean War was China’s last large-scale sustained military conflict, and today few to no Chinese officers have combat experience. This stands in stark contrast to the America’s last decade of continuous war; today a large portion of the US military, especially in its land forces, has experienced combat. In addition to the PLA’s decades of peace, China’s lack of experience operating advanced military technology is a serious institutional deficit that will be difficult to overcome. The Chinese military leadership recognizes this; indeed, China’s high-profile acquisition and refit of the former Soviet aircraft carrier the ex-Varyag is thought to be for training, rather than power projection. America’s power projection capabilities are dependent on centralized assets whose vulnerability is an important weakness of the US military. This centralization would allow China to partially mitigate its force asymmetry with the US by focusing on targeting and destroying these assets in a conflict, bypassing the bulk of US strength. If China wisely elects to avoid challenging the US on an even, ship-on-ship basis, then it should focus on attacking other vulnerabilities in America’s force structure, eroding US capabilities while avoiding its strengths. The Chinese term for anti-access/area-denial strategies, shashoujian or “assassin’s mace”, hints at this logic; like an assassin, in the event of hostilities Chinese forces will seeks to strike and destroy exposed vulnerabilities in US force structures, while denying their opponent the same opportunity. For example, US forces are much more dependent on satellite reconnaissance and communication than the PLA. Accordingly, China has developed anti-satellite weapons to attack this US vulnerability. The efficacy of shashoujian strategies are dependent on targeting the vulnerable foundations of an opponent’s force structure. Geographically isolated from its spheres of influence, the American presence in the Western Pacific is dependent on its power projections capabilities. While US power projection is formidable, it suffers from a key weakness: power must be projected from somewhere. In most contexts, this means large local bases and the US Navy’s eleven supercarriers, and to a lesser extent flat-top amphibious assault ships. It is difficult to overestimate the importance of carriers to America’s ability to project power. While no US naval assets can truly be considered expendable, carriers are expensive and rare enough to make the prospect of losing one frightening. US power projection is absolutely dependent on maintaining a fleet of these carriers, and losing one would be the greatest single military disaster the US has suffered since World War II. In addition to carriers, US power projection in the Western Pacific is dependent on huge military bases, a vulnerability often neglected in discussions of US force staging. These bases, the most important of which are located in Japan, South Korea, and Guam, allow US land and air forces to operate in areas that would otherwise to be unavailable to non-naval assets. These sanctuaries are also vital for logistics build-up and staging, a vital consideration in the distant Western Pacific theater. Rapid Chinese strikes against these bases would reduce the US’s ability to build up land and air forces in theater during hostilities, and the PLA has heavily invested in the short-range ballistic missile and strike aircraft forces necessary to conduct these attacks. Both the US Air Force and Navy are accustomed to operating from “sanctuaries” largely off limits to enemy attack, as rear operating air bases or ports have not been extensively targeted by an enemy force since World War II. If large bases are no longer a safe haven, US force structures and doctrine will be forced to change; for example, USAF aircraft would be forced to fly into the theater from distance airbases out of PLA missile range, reducing their available time on station. It is not clear if the US would be able to fight a sustained war in the Western Pacific if Chinese anti-access strikes degraded the operational capability of large rear bases. Sayers, Eric. 2010. “A framework for influencing PLA procurement trends.” Joint Forces Quarterly 58, 3: 89-93, 89. Crane, Keith, Roger Cliff, Evan Medeiros, James Mulvenon, and William Overholt. 2005. Modernizing China’s Military: Opportunities and Constraints. Santa Monica: RAND Corporation, 195. Robert M. Gates, remarks at the Naval War College, Newport RI, April 17 2009. McDevitt, Michael, and Frederic Vellucci Jr. 2012. “The evolution of the People’s Liberation Army Navy: The twin missions of area-denial and peacetime operations.” In Sea Power and the Asia-Pacific: The Triumph of Neptune? Eds. Geoffrey Till and Patrick C. Bratton. New York: Routledge. 75-92, 81. Bratton, P.C. 2012. “The United States as a Pacific power.” In Sea Power and the Asia-Pacific: The Triumph of Neptune? Eds. Geoffrey Till and Patrick C. Bratton. New York: Routledge. 19-45, 33. Krepinevich, Andrew F. 2010. “Why AirSea Battle?” Washington DC: Center for Strategic and Budgetary Assessments, 18. Cole, Bernard D. 2001. “The Great Wall at Sea: China’s Navy Enters the Twenty-First Century.” Annapolis, Maryland: Naval Institute Press, 22. Chen Te-Men. 2003. “Assessment of the PLAN’s modernization.” In Taiwan’s Maritime Security. Eds. Martin Edmonds and Michael M. Tsai. New York: RoutledgeCurzon. 3-14, 4. Sakhuja, Vijay. 2011. Asian Maritime Power in the 21st Century. Singapore: Institute of Southeast Asian Studies, 55. Bateman, Sam, and Chris Rahman. 2003. “Te PLAN’S rise and East Asian security.” In Taiwan’s Maritime Security. Eds. Martin Edmonds and Michael M. Tsai. New York: RoutledgeCurzon. 15-39, 18. Xu Qi. 2004. “Maritime geostrategy and the development of the Chinese Navy in the early twenty-first century. Translated by Andrew S. Erickson and Lyle J. Goldstein. 2006, Naval War College Review 59, 4: 47-67, 48. McDevitt and Vellucci 2012, 80. Crane et al. 2005, 182. Crane et al. 2005, 185. Schuster, Carl Otis. 2012. “China: Its maritime traditions and navy today.” In Sea Power and the Asia-Pacific: The Triumph of Neptune? Eds. Geoffrey Till and Patrick C. Bratton. New York: Routledge. 56-74, 61. McVadon, Eric A. 2007. 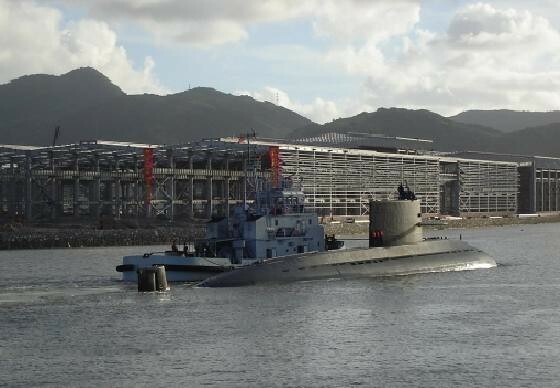 “China’s maturing navy.” in China’s Future Nuclear Submarine Force. Ed. Andrew S. Erickson, Lyle J. Goldstein, William S. Murray, and Andrew R. Wilson. Annapolis: Naval Institute Press, 4. The 1962 Sino-Indian War and 1979 Sino-Vietnamese War were destructive, but both relatively short conflicts. Neither involved significant naval action. Van Tol, Jan, Mark Gunzinger, Andrew Krepinevich, and Jim Thomas. 2010. Air Sea Battle: A Point of Departure Operational Concept. Center for Budgetary and Strategic Assessment, 23. Van Tol et al. 2010, xii. Van Tol et al. 2010, 25.